Rome, 17 February — A multitude of flags welcomed development leaders, heads of state and government representatives from all over the world to IFAD's 39th Governing Council (GC), where members of IFAD's decision-making body convened. Rural farmers and representatives from many nations came together to address the monumental task at hand: achieving the Sustainable Development Goals. 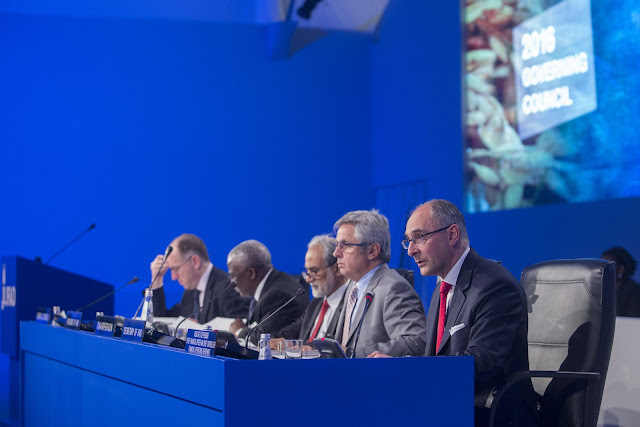 The GC, which has taken place at IFAD headquarters for the last six years, assembled in a spacious tent. 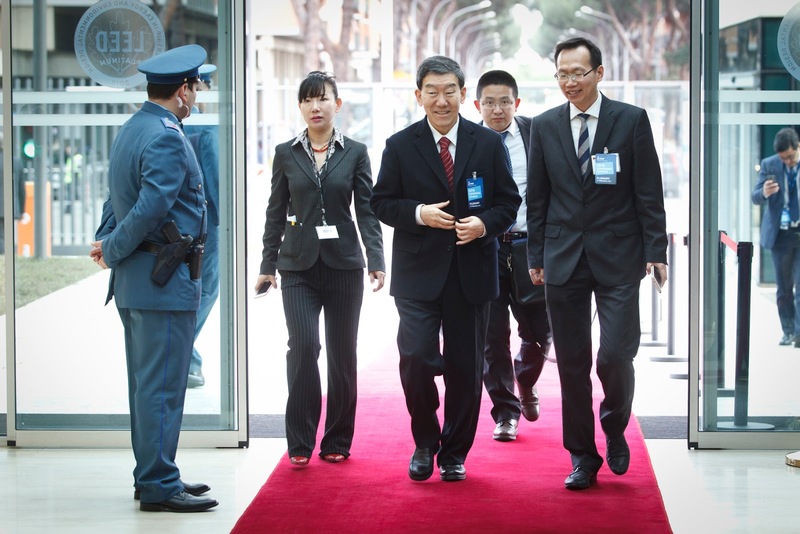 Before entering the tent, many high-level guests from around the world stopped for photographs in front of an IFAD backdrop. One of these guests was His Excellency Sergio Mattarella, the President of the Italian Republic, who was greeted by IFAD's President, Kanayo Nwanze and a frenzy of photographers. Once His Excellency was escorted into the tent, he was introduced by Nwanze to give the keynote address. 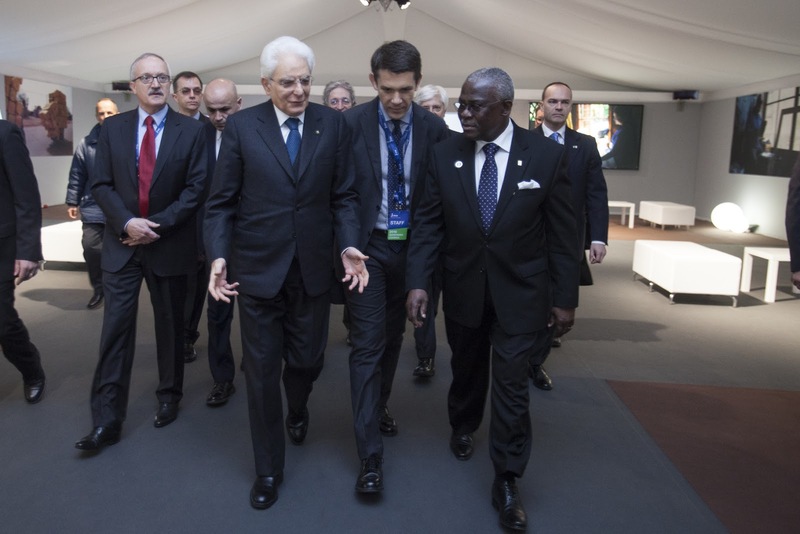 President Mattarella pledged that Italy will play a role in the eradication of hunger and poverty. He brought attention to the current refugee crises and called leaders of all nations to get involved, saying: "Saving human lives and reaching out to those fleeing war or misery is a moral duty, a duty for any society that defines itself as free, democratic and authentically respectful of human rights." In regards to the SDGs, His Excellency spoke about the importance of sustainability and the fundamental role agriculture and small farmers play in reaching all seventeen goals. He commented on the cross-cutting nature of these goals, saying "the issues are not separate chapters, they are many pages of the same book working towards inclusion" and that Italy will play a central role in achieving them for the well-being of future generations. President Mattarella concluded by saying: "The hunger, poverty and the deprivations chain is strong but it can and it must be broken." 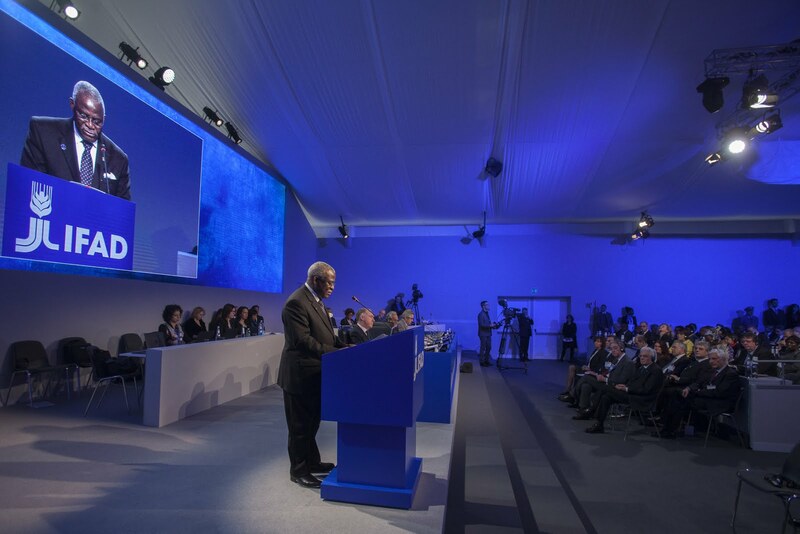 Nwanze followed His Excellency, and gave a statement to close the inaugural ceremony. 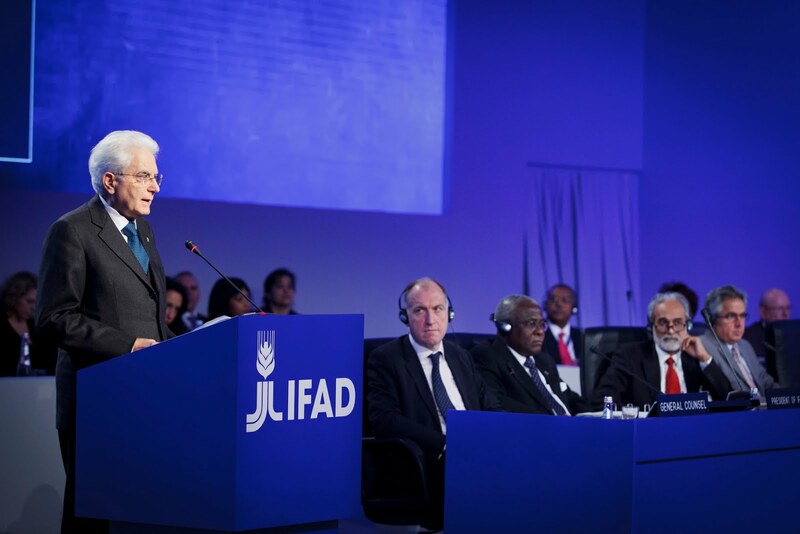 The President of IFAD opened his address by warning the audience that, without the continued efforts of IFAD and other organizations, it is quite possible that the recent gains made in the fight to end poverty and hunger could be reversed. The focus must remain on long-term development, specifically achieving the SDGs. According to Nwanze, this feat depends on smallholder farmers and their ability to transform rural areas into being more productive, and IFAD expedites this process by "investing in small farmers so that they can grow their businesses and improve their lives through their own efforts; not through hand outs." 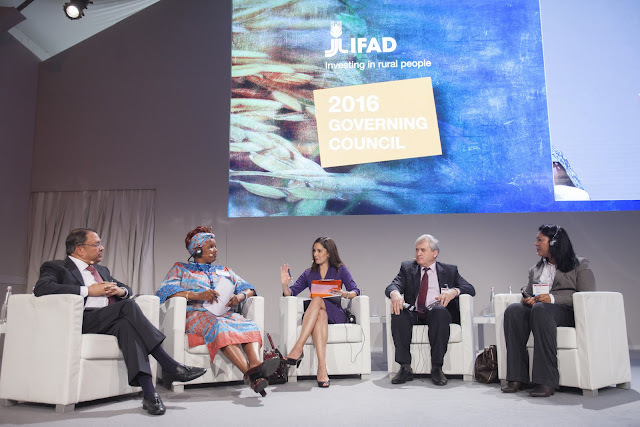 Nwanze also discussed changes made in the way IFAD conducts its business and how it assesses its own impact. He shared some promising statistics: IFAD has reached 139 million people and saved five million hectares of land through its projects that opened or closed between 2010 and 2015. Nwanze concluded that "project participants are better off than they would have been in the absence of IFAD." Despite this good news, Nwanze cautioned that there is much more work to be done, citing the refugee crisis. To Nwanze, "it is imperative that we commit to investing in long-term development." The next person to take the stage was international journalist Babita Sharma, the moderator for the panel on Implementing the Sustainable Development Goals: Galvanizing Private-Sector Action. Sharma was joined by a diverse range of panelists, which included: Sunny Verghese, Olam International CEO; Jussara Dantas de Souza, the Commercial Manager of Family Agribusiness Cooperatives of Canudos, Uauá and Curaçá, and Brazil; Beatrice Nkatha, the Founder and Managing Director of Sorghum Pioneer Agencies in Kenya; and Victor Rosca, the Director of IFAD Consolidated Programme Implementation Unit in the Republic of Moldova. Each panelist offered a unique insight to the private sector's role in creating a more sustainable society. Nkatha spoke about how she thought it was the responsibility of both the government and the private sector to work with smallholder farms. 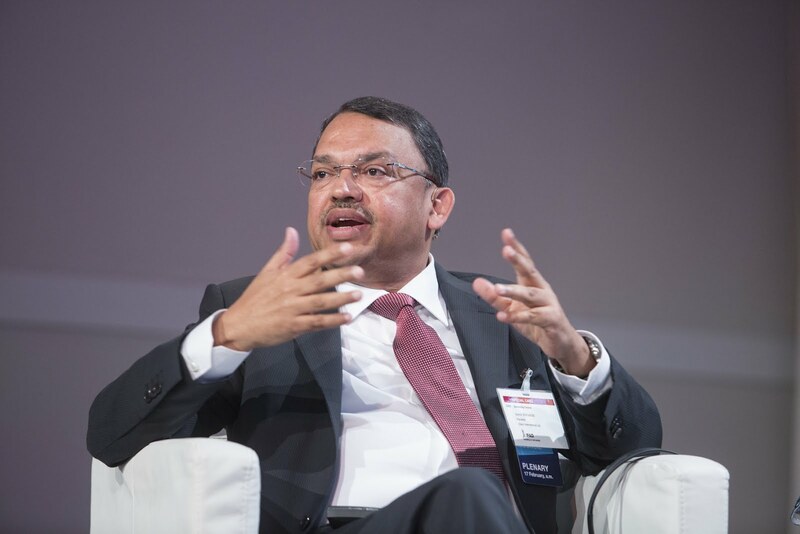 Verghese also believed that the private sector will have to play an increased role as governments are becoming more burdened with other costs. Rosca similarly described the potential role of the private sector to be "enormous," but said it would not be an easy task to enlist supporters. Citing a project he worked on in Moldova, he described the skepticism financial institutions can have about investing in these kinds of projects. However, according to Rosca, once the banks saw that their investment paid off, "Their attitude changed. We were able to convince them that it is necessary to invest in agriculture, and they were quick to agree." Dantas de Souza also spoke about the importance of perspective and motivation. She described the need for private institutions and groups to help educate and motivate small farmers, citing an example in Brazil of Canadian missionaries encouraging local women to take on a larger role within their society to improve their lives. To Dantas de Souza, "when there is a will, there is a way," and this will must be sparked within rural farmers so they can help themselves. The panel offered fascinating perspectives on the SDGs, and reiterated how important it was that people from each corner of the world work towards these crucial goals.